When it comes to small home office ideas, a closet’s about as tiny as you can get. It’s also unobtrusive to daily activity flow in the home, and easily closed off when the kids come home from school. Here’s some office inspiration from Shoestring Magazine. Today’s home-based careers frequently require you to manage a mobile office, whether that means operating out of wheeled briefcase or using a rolling office cart you can put away before the family comes home as this article from Apartment Therapy suggests. As long as your core resources can remain organized as you move, you should be able to juggle mobility efficiently. You can do this with file boxes, cloud storage, fishing tackle boxes or basically anything that keeps critical items contained and organized. If you’ve actually managed to set aside an entire extra room for your small home office, you can still stay on budget by using what you have on hand to furnish the room. For example, when building a standing desk on my own, I used rolling metro shelves from my garage. Other repurposed items in our home office include a folding banquet table and bookshelves made from boards and concrete blocks. It may not be the sexiest looking small home office, but it gets the job done. We prefer to channel biz funds towards items that can help us increase revenue, such as upgraded digital cameras and more functional laptops. Keeping our home office basic allows us to do that. One of my favorite small home office ideas is to create a working office from an old armoire or hutch. These make a great deal of sense for home-based businesses where extra rooms and even closets really aren’t available. Creating your office out of a hutch or armoire allows you close the doors at the end of the day just like you would in a regular office, and keeps your work materials out of the hands of visiting children and prying pets. Many parents looking for work-at-home jobs still need to tend to home needs themselves, at least until the revenue flow is strong enough to consider cooking and cleaning support. It’s one of the challenges that come with a home-based business, and isn’t likely to change anytime soon. One way many people choose to get as much multitasking done as possible is to leverage their working space by parking near an area where other things can be accomplished. In many homes, this area is the kitchen. Those who locate their washer and dryer in that room as well can really make their downtime function more efficiently. How many times a day do you have a phone conference with a colleague you know well? If all you’re doing is brainstorming a strategy solution, why not fold a little laundry or toss something in the slow cooker at the same time? This idea for a kitchen office from This Old House shows you how to shoehorn a space into the end of a kitchen cupboard. 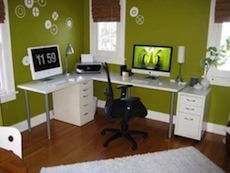 In short, it’s completely possible to implement small home office ideas on a budget. It just takes a little determination and some thoughtful purchasing decisions. It would also be nice if you make your workstation as work-inducing as possible. Clean it up always and keep things in their proper places. I’m pretty lucky in this area – I have a friend who works for one of those big office suppliers, and he gets a 50% discount. Just glad that he’s kind enough to pass on those discounts to friends. I love my home office and appreciate the convenience. I also adore the photo. It’s very easy, as you mentioned to keep it cheap when creating a workspace (especially if you live near Ikea)!